Wow, my label for Gigantic's Catch 23 was chosen to duke it out in the CNBC Battle of the Beer Labels! With thousands of people voting, the artwork made it to Round 3. Not bad! It was even featured as one of three Underdogs to Watch. Recently, a few super-cool comedians tweeted out pics of the comedian portraits that are up in the green room at Cobb's Comedy Club. So I've gotten a lot of interest from folks wanting to buy prints. I can't offer prints of the artwork that's up at Cobb's BUT I can offer to draw for you an ORIGINAL 8"x10" ink caricature of any comedian (including yourself!) for the Low-Low price of $50. Include a line of text if you like. Just keep it Tweet-length. This offer is only for drawings of working stand-ups (now or past), comedy podcasters and comedic actors. PayPal to Ben(at)BenWalkerArt.com $50 per comedian. Let me know if you want a line of text, and give me 3 weeks from the time you submit your order. Include an address. Shipping is Free! Wow, I've been so busy with projects (and a case of comedy-nerd flu) that I'm just now able to take a minute and re-cap the highlights from SF Sketchfest! I kinda wanted to see every show put on by SF Skefchfest. Even when I'm selling posters for a show, I'm not always able to see the performance. But there was no way I was going to miss Maria Bamford! To my delight I got the green light to make a poster and come to her shows. This had to be the busiest week of my life. Just after finishing the poster and play bill for the Waiting For Guffman screening I took three days to figure out the Maria Bamford poster (that includes a day or so of sketching concepts that went in all sorts of un-helpful directions), then I had two days to create the poster for the Bob's Burgers Tribute show. Saturday night was Picture This! at the Eureka Theatre. I drew live accompanying comedian, Amy Miller. I made the poster for that show too (below). Oh, and in the middle of all this, I spent Friday night drawing caricatures of party-goers at the Edwardian Ball. 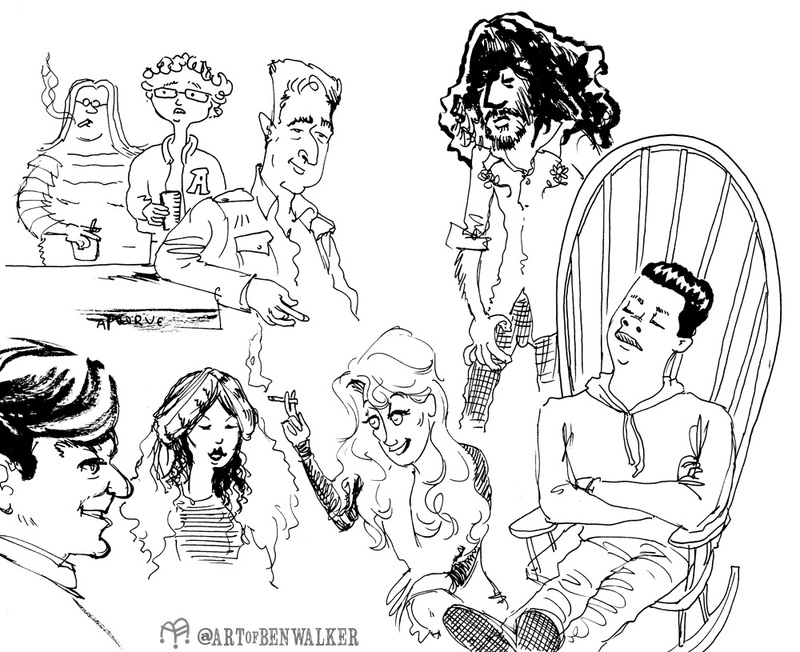 Check out all the SF Sketchfest posters and some rough sketches. The final concept started out as pencil sketches based on Bamford's wig-wearing pugs. The artwork was "inked" and colored in Manga Studio. I had a lot of fun playing with the half-tone dot capabilities of the program. I've been looking for a way to add tone this way for like ten years! Super easy. Next time I won't go so subtle with it. For the Bob's Burger Tribute poster I wanted to see how well I'd do drawing everyone on-model (meaning it could fit with the artwork on the show). Wow, that's tough. Once I had an idea of what everyone is doing in the "scene" I drew each character on it's own sheet of tracing paper. That's the hard part, then they're scanned, inked and colored in Manga Studio. The text was done in Illustrator. I tried to keep the text pretty basic to stay with the placemat menu look. Picture This! was a lot of fun! Every comedian and artist involved in the show is my new best friend. The artwork for the poster was done entirely in Manga Studio. I bought the program a few months ago and can't praise it enough! So much better than Illustrator or Photoshop for drawing and coloring flat artwork like this. Oh and it's hella cheap. I bought it on special for $15 bucks! Thanks for reading and I'll see you next year at SF Sketchfest! Big thank you to Cole Stratton, Janet Varney, Dave Owen, Sam Valera, Brandie Posey, Maria Bamford (and management), all the folks that make Bob's Burgers, Lauren Bouchard, Bento Box, Christopher Guest, Bob Balaban, Parker Posey, Fred Willard and Kevin Pollak! More comedy show posters & merch on the way! SF Sketchfest, the San Francisco comedy festival is back! I was asked to do something special for the screening of Waiting for Guffman. OK! Bob Balaban, Christopher Guest, Parker Posey, Fred Willard and Kevin Pollak were on-hand for a Q&A session after the movie. I wish I could have seen any of that, but it was cool hanging out in the lobby of the Castro too...I met Parker Posey! So there is that. I printed a run of 100 and they nearly sold out. Posters come with a "program" for Red White and Blaine. This is the third poster I've done for Dana Gould. So fun! For this NYE show I went with a fancy, art deco feel. Picture This! 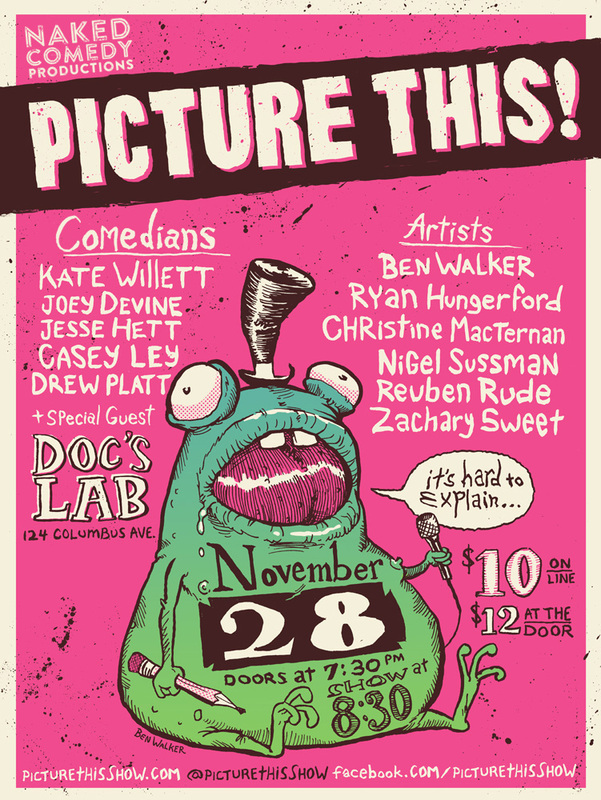 is happening again at Doc's Lab, November 28th! Check out the great lineup of artists I've wrangled. Lots of first-timers. Come see comedy and cartoons collide. And after Picture This!, stick around for my new after-show, Deal Killer! It's a cartoon-driven comedy game show about dating and relationships. Kate Willett, Amanda Walker-Storey and DJ Real will answer my ridiculous questions about things that might happen on a date or in romantic relationships. 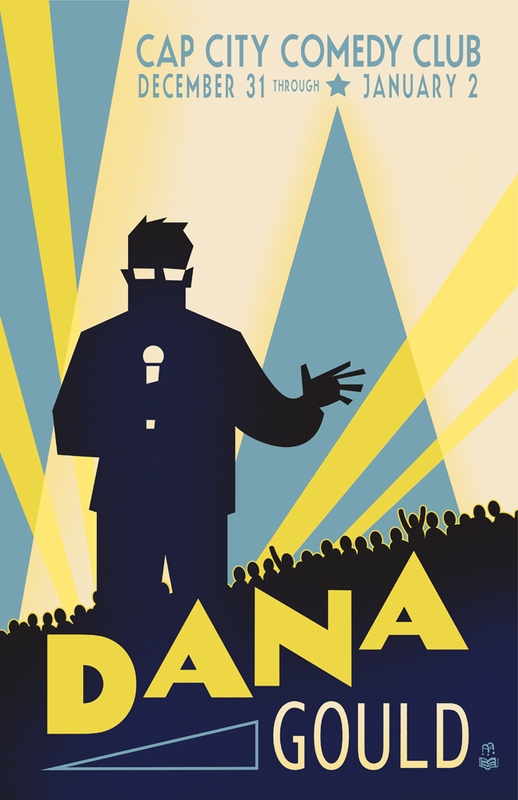 Another poster for Dana Gould! You don't know how much joy it brings me to see DanaGould.com taken over with my artwork! Dana Gould Live at Punch Line S.F. The beginning of October has launched me into the busiest time of my life. Let's see, I started a job as an boys Tee designer at Tea Collection. The freelance work is blowing up. I've been doing a bunch of multimedia-comedy shows (More on these soon). And the artwork for Cobb's Comedy club and Punchline keeps coming! I'm so excited about this latest poster for Dana Gould. He is one of my favorite comedians working today. You may know him from the decades he's been killing it on stage, or from the opening credits of The Simpsons. Or from his podcast, The Dana Gould Hour. One thing I really like about his podcast is when he geeks out on old horror and sci-fi movies. I'm constantly putting down my paint brushes to scrawl down movie titles. Plus he does this thing that I call the "bridge" of his podcast, Dana calls the "middle part" where he tells listeners a bit of history on film, Hollywood, crime, etc. It's great for guys like me who aren't good at book-reading. Anyway, thanks to these geek-outs and middle parts its clear that Dana and I share a lot of interests. While my first rough mockup was a straight-up spoof of the poster for The Ghost and Mr. Chicken, I ended up loosening up the composition, adding as many essential and deep-cut movie references as I could fit. It's all done in real-life brush and ink on paper. with the color added in Photoshop. Posters are being made available on ComedyFilmNerds.com (they're working out some technical difficulties, hopefully won't be long). So I spent the weekend taking in the shows and selling posters in the lobby with Dana. Uh, that was cool! Emma Arnold is Hilarious! I'm so glad I got to get to know her too. Kate Willett is also a fantastic San Francisco-based comic you will be hearing more and more about. We run a show together at Doc's Lab. If you haven't seen Picture This! yet, you should. The Gould poster has also been immortalized as the "cover art" for the most anticipated podcast of the year, The Halloween episode of The Dana Gould Hour! Give it a listen, monster-kids! Last Sunday, August 23rd Kate Willett hosted a comedy show and private party at The Convent in San Francisco. The whole thing was taped by VICE. It seemed like every young, SF comedian was there. Like some kind of embedded reporter, I spent the whole night scratching out records of the night.